Whitfield House, a magnificent stately home nestled in the Herefordshire countryside, is saving money on its heating bills and making use of the acres of managed woodland that surrounds it, thanks to a wood-chip burning heating system from Euroheat. 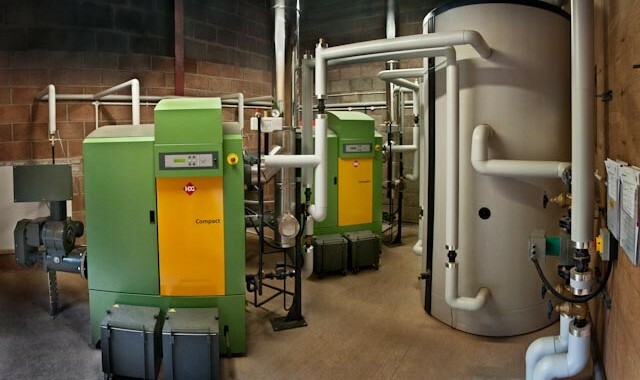 Comprising two 65kW HDG compact chips boilers, a chip store, hopper and accumulators, wood-fired heating is saving the building’s owners the previous £25,000 a year spent on oil. With the estate’s trees felled, dried and chipped on-site, warmth is effectively generated for free. The entire system, including associated piping and the specially built plant room, 140 metres from the main house, came to approximately £200,000. With fuel costing nothing, this should be paid back in approximately eight years – less if the Renewable Heat Incentive (RHI) comes into play. Because the building’s owners were living in the property during the change-over the old heating system had to be fully operational while the HDG boilers were installed. The Efficient Energy Centre, which completed the project, was responsible for the original oil-fired heating, installed 10-years previously, so had the inside track on the nuances of the building. Alun’s approach is representative of the type of installers Euroheat is looking for. 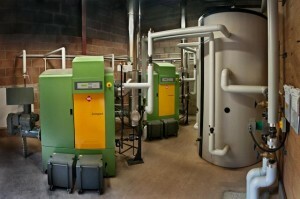 Wood biomass needs to be treated as a total solution – it is not just a case of plumbing in the boiler. For heating installers in rural communities it is definitely a solution worth considering – The Efficient Energy Centre is very busy – representative of the growing market-place where wood biomass boilers are providing a viable and cost-saving alternative to oil-fired heating.